If you shudder when hearing the words “network-attached storage” you can at least take solace knowing that you aren’t alone. NAS devices seem intimidating and unfriendly (even the terms “NAS” and “network-attached storage” have the stench of jargon), but they can be quite useful, especially in a home with multiple computers. Seagate wants to make NAS more consumer friendly, and they take several steps towards that goal with Central. Central is a single-drive unit, so it’s not as big and noisy as other NAS devices that have multiple drive bays and a large fan to keep those drives cool. Multidrive NAS devices are often set up as a RAID 5 array that provides data redundancy, so if one of the drives fail, you can replace just that drive and your data will be restored from the other drives. In Central, you don’t have that luxury, and there’s no built-in way to back up Central itself, so you have to manually back up any files you store on Central’s single drive. Central has an ethernet port as well as a USB port on the back; it does not have Wi-Fi. The USB port can be used to connect another hard drive that appears separately from Central on your network. (You could use the second drive to make drag-and-drop backups of your Central data.) 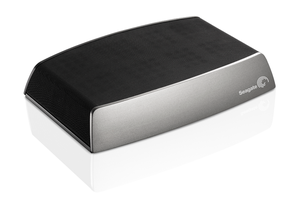 Central is always powered on, but the drive will go into a low-power mode when not in use. You can access Central outside of your home network by using a browser. Probably the most harrowing part of using a NAS is the initial setup, but thankfully Seagate makes it pretty painless. After you connect Central to your router, it appears on the Mac as a shared device. The initial setup involves clicking a webpage that takes you to the account setup where you need to enter usernames and create passwords. Simple enough. After you create an account, you can log into Central using your newly established credentials through the Finder, and then drag and drop files back and forth between your Mac and Central. 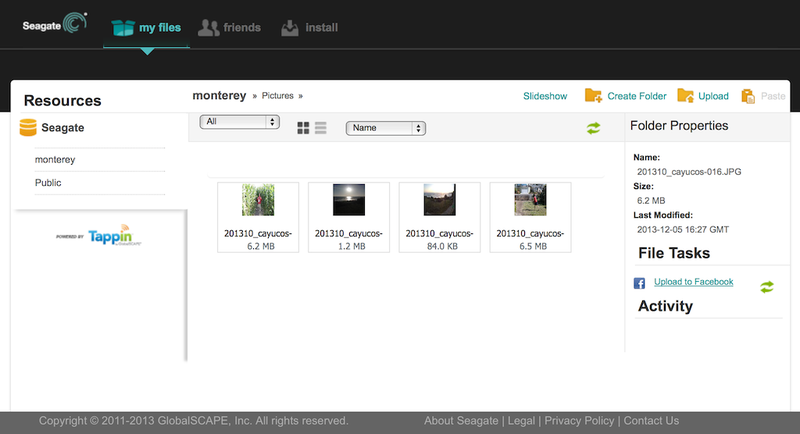 You can set up private folders for each user, and there’s also a Public folder for files everyone can access. You can also use Central as a destination for Time Machine and a place to store your music in iTunes. Seagate provides remote access to Central through a Tappin-based service. You have to use an email address as your username (which you can do as you set up Central or later in Central’s settings), and you can log into your drive through a browser at https://remoteaccess.tappin.com. Seagate has mobile apps for iOS, Kindle, and Android, but they are limited, allowing access only to Central’s Public folder. However, I was able to access a private folder through Safari on an iPad. Central also has the helpful feature of being able to back up pictures posted to your Facebook account—a good idea, since people are using Facebook as a photo repository. You can use the free Seagate Media mobile app (iPad version, above) to remotely access Central, but the apps can access only Central's Public folder and not any private folders you've created. Our lab did performance testing on Central and found some pretty good numbers. With a 10GB set of files and folders, Central posted a write speed of 16.9 MBps, and a read speed of 20.1 MBps. With a 10GB file, the write speed was 40.3 MBps, and the read speed was 75.2 MBps. Multidrive NAS devices are faster, but these numbers aren’t too shabby from the single-drive Central. Seagate Central is a user-friendly way to add network storage to your home network, but you’ll need to manually keep backups of your Central data in case the single-drive unit fails. Its mobile apps are limited, but Central works well when accessed from a computer. Central works wells for anyone who wants an easy-to-use network-attached storage device that's quiet and compatible with iTunes and Time Machine.